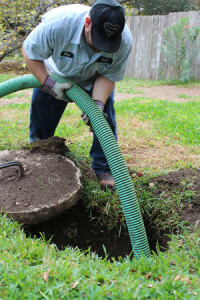 Hiring a professional to clean your septic tank can be challenging, especially if you’re not sure what to look for, and what questions to ask. A good provider will always answer your questions and be willing to walk you through any aspect of your septic system. Generally, the longer a company has been in business and has been pumping septic tanks, the more experienced and knowledgeable service you will receive. Ask friends, family, and neighbors for recommendations. Does the company carry General Liability and Workers Compensation Insurance? These insurances protect you, the homeowner, from being held responsible should the company employee be injured on your property. Check to see if the company is registered with the Texas Commission on Environmental Quality and the San Antonio Water System (or whichever local system you are a part of). These licenses indicate that the company is honest and disposes of waste in a legal and safe manner. You, as the generator of the waste, hold the ultimate responsibility for proper waste disposal. After your waste is properly disposed of, the company who pumped your tank is required to provide you with a disposal manifest. Does the price include finding the tank and exposing the lid(s)? Most tanks installed after 1987 will have two lids that require digging to properly clean both compartments of the tank. Some companies only pump out one of the compartments and charge extra for digging up the lids and charge extra for extra hoses if they have to use them. Some companies charge separately or additionally for dumping. A normal septic tank cleaning should take less than 1 hour; extra charges may apply if the tank is hard to locate, buried deeper than normal, or has very heavy sludge. Make sure you are aware of any additional charges before you hire a company to pump your tank. Some companies accept only checks or cash. The most common methods used to locate a tank includes a probe and metal detector. However, if a tank is difficult to locate, or it is suspected that it may be located under a deck, patio, driveway, etc., a flushable electronic locator can be used to help find the tank. A vacuum truck that carries more hose can usually pump the tank from the street or your driveway, verses having to drive on your lawn to get right up to the tank. Some lids are not constructed with very much reinforcement and break easily when removed. Some lids that are sealed to the tank and must be broken up to be removed. If the crack or broken lid poses a safety hazard, the lid should be replaced. Each time the tank is cleaned, the pumper should check for any problems in your tank. Do they pump the tank though the tank lid(s) or the cleanout? Proper cleaning can only be accomplished through the tank lid(s). Do they wash out the tank after it is pumped? Both the solids and the liquids should be removed from the tank, then the tank should be rinsed with water. Some companies will only collect the liquids and leave the solids in your tank. Companies that keep thorough pumping records should have a system in place to remind you to pump out your septic tank every 3-5 years. Van Delden Wastewater Systems has been family owned and operated since 1937. We pump over 2,000 tanks per year, and our expertise is unrivaled. Our pumpers are well trained and experienced. We pump septic tanks the right way, every time. Our pumpers are not on commission, so we will never sell you something you don’t need. We routinely check the inside of the tank for baffles, roots, walls, leaks, backup, etc. and keep accurate records so we can remind our customers when it is time to have their tank cleaned again. We are licensed by the TCEQ and SAWS for waste hauling, and only dump waste in a legal manner. We carry general liability and workers compensation insurance for the protection of our customers. If you would like a quote, more information, or if you would like us to remind you when its time to have your tank cleaned, please contact us. We would be happy to assist you.